Ideal for labels on rolls, the white BOPP (biaxially oriented polypropylene film) label material is a plastic film material that has great clarity, is resistant to UV rays, has excellent chemical and abrasion resistance, and with it’s smooth surface – is definitely a show-stopper! Great for use on candles, jams or jellies, sauces, vitamins, bottle labeling, warning labels and for labeling products in the health & beauty industry, it’s a no brainer to choose the white BOPP material for your label project. What about the resistance of the ink? Because our inks are UV cured, the ink should technically be just fine, but if you are concerned at all about the ink running or wiping off, add a laminate to the label to protect the ink from any pesky chemicals, oils or solvents that may try to seep in. 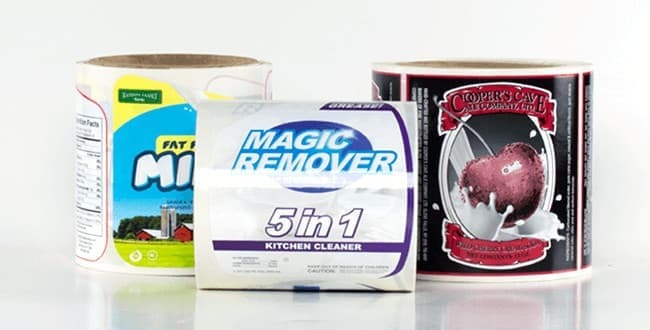 In addition to making the material and ink super durable, laminates can also offer a different appearance, or aesthetic, to your application's presentation, so keep that in mind too when designing labels for your packaging. Matte, glossy, indoor and outdoor laminates are available! The liner on this material is thin and malleable, making it flexible for labeling products with a tight mandrel (for example, test tubes). BOPP materials are great for long run, high volume projects, as we’ll be able to fit more labels per roll due to the flexibility of the material.